Visit my artist page on UGallery to see what works I have for sale. I will be adding more in the coming weeks. In just a couple of days I am off to my biophilia residency in Quebec. I am really excited about it and can’t wait to learn, research and be inspired by all of the activities. I have decided to unplug for the week. Lately I have been feeling very overwhelmed by all of the information coming at me, it’s just too much. This residency is a perfect opportunity to get back to nature and really be present. So no social media, internet, laptop or TV for me. I am making an exception for my Kindle and Ipod. I can’t live without my music and books. Although this is not an art making residency (more for research and learning) I plan on doing a lot of writing and sketching. I will be bringing a small watercolor setup and a cyanotype making kit. Both are pretty small and require minimal setup. I promise to share all of the details and images with everyone when I get back. I am participating in the KALEID Gallery Art Supply Swap Meet. I recently did some cleaning, purging and rearranging of my studio and have lots of extra supplies. Things like, paint, frames, collage material, glass bean making supplies, an old Photo enlarger for a dark room and lots of other fun stuff. If you are interested in getting some new supplies at a discounted price you should stop by. Or if you have a bunch of art and or craft supplies you want to get rid of you should sign up to sell. Being a mixed media artist I need and use all kinds of different supplies, not all of them are traditional art supplies either. Some of the places I patron are pretty standard but others are very unique. So I thought it would be fun if I shared some of my favorite supply stores with you. This is an amazing natural history store. They have everything you could ever imagine, bones, fossils, insects, feathers, teeth, books, eggs, taxidermy, meteorites, casts and more. It’s a small store but they have it filled from floor to ceiling. The staff are really wonderful as well. In the past they have sold my copper electroformed jewelry. They have reasonable prices and if you have a business with resale license you can have your resale permit on file so you do not have to pay sales tax. This is another natural history store but with a more decorative higher price point. They sell a variety of unique air, succulent and carnivorous plants. They also have insects, fossils, bones, books, and other oddities. I think every artist/crafter knows about and shops at Michael’s. They are great for quick trips when you need something standard. They also usually have really good coupons and sales on frames. Recently I got $300 worth of frames for $125 because of coupons and sales. This is where I get my bulk wax and damar resin for my encaustic making. They have always been easy to deal with and ship quickly. They have the best prices for bulk wax that I have found. This is a local art supply store, they are more fine art than Michaels and are convenient for a variety of supplies. If you have a business with resale license you can have your resale permit on file so you do not have to pay sales tax. I also get a variety of items from these places. I try to visit them frequently so I don’t miss anything. I usually get my used books at the local library sales. They usually have them once a month and most of the time you can fill a paper bag for $5. Well, it’s been a while since I posted anything. I tend to lay low after a big exhibit opening. There is always such a build up to these events, then it happens and afterwards you are not quite sure what to do with yourself. I have been continuing my creativity coaching training and really enjoying it. I don’t know what I am going to do with it yet. I do like teaching, mentoring and helping others. I think it might be fun to offer a creativity workshop or class series. I am exploring offering online & email workshops as well as in person ones. The beauty of an online workshop is that you can attend at anytime from anywhere, there is a lot more flexibility. I might even use this blog as a starting place for my creativity tips and articles. I have been really wanting to attend another artist residency. Now that I have a child my options are a lot more limited. It is difficult to find places that allow children. A lot of the ones that do having waiting lists and or you have to apply a year or more in advance. It’s difficult to plan that far ahead with a toddler. So for now I have decided to create my own art retreat. In January I am going to go to the Big Island of Hawaii for 3 weeks. I hesitate to call if a vacation because I plan on working while I am there. I am so excited about just getting away and creating. No TV, housework, obligations, etc. I will be bringing my daughter so I am sure there is going to be an adjustment period but I will just have to roll with it. 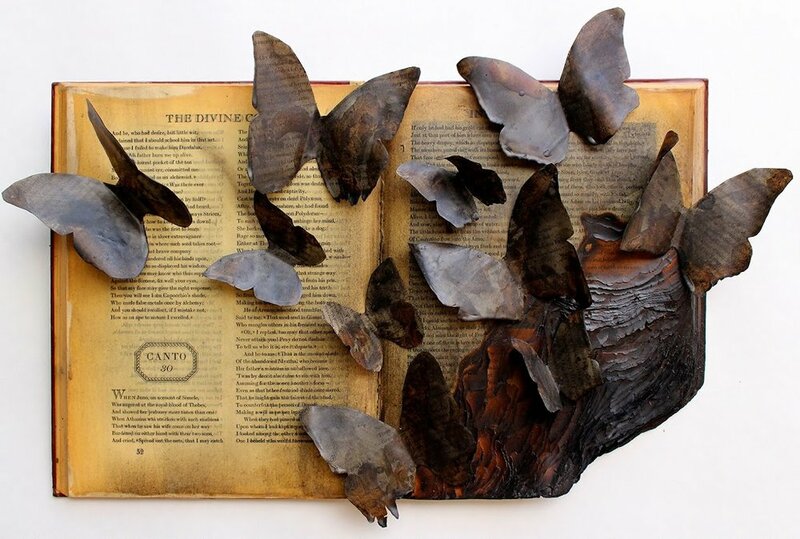 Here is a book art piece that I recently created. 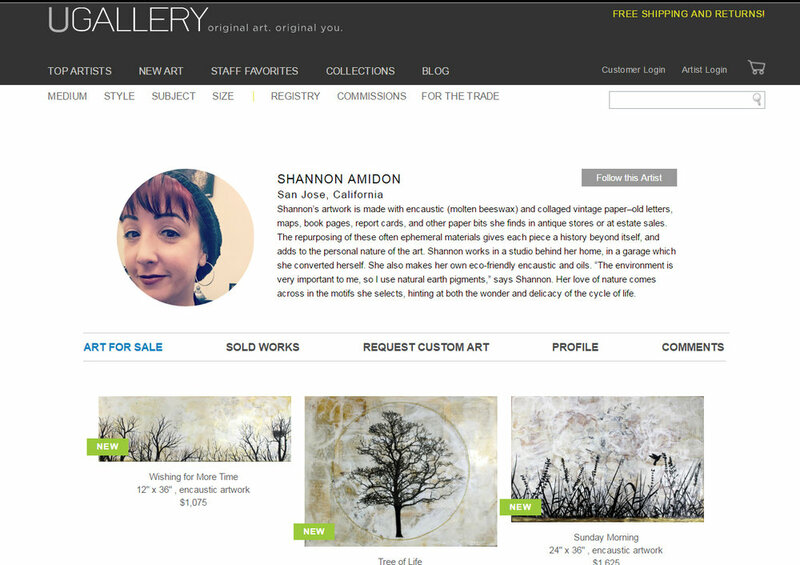 It is currently for sale at Gallery 85 in San Jose. Often I try not to use a specific book when I create, I just let the form, size, color, etc. guide me rather than the subject. In this case I did draw inspiration from the book content, Dante's Inferno. As you can see the book has been burned and chard butterflies are emerging from the burnt section. The title of the piece refers the section that the book is opened to which refers to Myrrha the mother of Adonis. Libythea Myrrha is also a species of butterfly. In a few weeks I will be flying across the country to Hamilton Ontario Canada. Hamilton is about an hour away from Toronto and Niagara Falls. It is a port city on the west end of Lake Ontario. I will be spending several days in the area exploring the local art scene and other attractions. The Royal Botanical Gardens look fantastic and they currently have an Ephemeral Earth Art exhibit that looks very interesting. The main reason for my visit is to attend my opening reception at the Nathaniel Hughson Art Gallery on August 8th. I am very excited to be exhibiting my Selcouth series and have created several brand new pieces specifically for this show. The reception is the same day as the James St North art crawl where over 20 galleries and art spaces host their opening receptions. If you are in the area stop by and say hi. I would love the opportunity to meet and talk to you. I am really looking forward to getting to know the art community in Hamilton and learning more about the city. I was able to connect with several of the area artists online and they were so friendly and helpful.